My Life Journal: BOLT Is Known Of Its Superbark! BOLT Is Known Of Its Superbark! It was like decade since my last drop of words in this blog. I was away from updating not only this blog, but also other blogs of mine. My family was down with some unsubsided fever viruses. First, it was my girl for six days, followed by me with another six days. The worst was, my son got it for the next six days! Lastly, it was my parents' turn. What kind of a circulation was that?? It was really scary to me! Due to the increase of age, I felt really suffering when having fever. I vomitted whatever I ate, and even fainted for few seconds once at home. Now only I understand what others mean that having chicken pox or measles during old age suffer more than young age. After three weeks "sick leave", I couldn't wait any longer and there I went with both my kids for BOLT movie. BOLT is the cute dog in the picture. The other two animals are the co-stars in the movie. My kids and I like the movie very much. The story is entertaining and quite funny too. My girl giggled away throughout the movie. I didn't read about its preview before entering the cinema. When the movie started, I really thought that Bolt has amazing powers, especially impressed with its devastating Superbark! Bolt looks cool! Later on then only I realised that human was behind that! Human was just using Bolt to be the television hero. Poor dog! Anyway, there was a scene in the end which touched our hearts. Even Bolt has no superpowers, it was very brave and loyal to its human. It risked its life to save its owner. 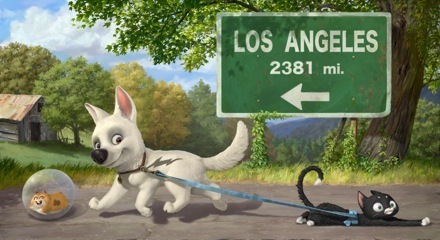 It showed its true Superbark and of course, Bolt and its human were saved! If you watch the movie, you will understand what I mean.